General Tso's Chicken is a huuuuuge guilty pleasure of mine. It was a staple of my college diet. Trouble is, since moving out here to Albany, I've had a heck of a time finding somewhere that can give me a decent version, let alone a GREAT version. I was wondering if any of your readers shared my guilty pleasure and could point me in the direction of their favorite spot. I live in Albany and work in Latham so anywhere near either place is fair game. Aside from Ala Shanghai and Hong Kong Bakery & Bistro, we don't hear much about individual Chinese food restaurants around the Capital Region. That is undoubtedly our fault -- we're probably not listening in the right places. So, this question is a good opportunity to maybe learn a little bit more. Got a suggestion for Sean about a good place for General Tso's chicken -- or good Chinese restaurants in general? Please share! Asian Place on Madison Ave is great. Like really good. And I have heard wonderful things about Plum Blossom in Troy as well. Did anyone mention Buffalo Wagon yet? Although not in the geographic of Latham or Albany, Plum Blossom on Hoosick St. in Troy has my favorite rendition of the dish, probably ever. Instead of an overly sweet red-ish brown sauce, theirs is very dark brown and has elements of sweet and a little sour. And the best part for me: instead of the tiny flavorless red peppers that usually spice the dish (which is fine for average takeout), they use thin sliced jalapeno peppers. Phila Fusion's "General Tao's Chicken" is pretty good IMO, if you're in the Saratoga area. Rain Modern Chinese on Lark Street, all white meat, great sauce. I like to ask for it extra spicy! As a vegetarian, the best info I can give you is that Ocean Palace (68 Central Ave, Albany) makes a superb General Tso Tofu and you can extrapolate that they'd do a mean chicken version. In fact, they are the only place for General Tso Tofu. I tried many places in the Capital District in the dark period between Chef Peter's ownership of CCK's and his new venture at Ocean Palace. Peter hits just the right note of sweet and spicy (plenty of hot red peppers), al dente treatment of the broccoli. and crisply fried tofu glazed with the sauce. So try the chicken. Buffalo Wagon is my local favorite. Usually crisp and good sized pieces of chicken, instead of tiny or monstrous, and encased in gelatinous goo. At least, when you eat in. :) YMMV if you take out, but I think it survives relatively well. Another vote for Rain on Lark. And thank you for the tip, Jen! It would be great to finally taste some heat with this dish! Nishiki in East Greenbush. They don't serve General Tso's but that's okay because you never should order it. Try the sushi rolls - they're always good. I second Plum Blossom on Hoosick Street. Best Chinese food in the area. in albany, ichiban's general tso is passable. Bamboo on Carmen Rd. 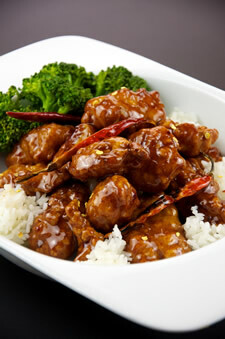 in Guilderland has great General Tso chicken and really tasty food in general. They also have great Thai dishes especially their pad thai. Sake Cafe on New Scotland Ave has great General Tso's. Eating it fresh in the restaurant is always best as any delivery tends lose some of its crispyness, but honestly either way it's delicious and my go-to spot. Another vote for Plum Blossom in Troy! Ocean Palace on Central. -White meat chicken, and fried rice that actually hits a wok! Ocean Palace can't be beat for superb food at a very fair price. Their food is always freshly prepared to order and the vegetables are very fresh. The best General Tso's used to be at Emperor's on Wolf Road. So depressed they closed as their food rocked and the staff were so nice. Does anyone have any back story on what happened? Oh, man, I'm so suggestible that I had to drive over to Ocean Palace for an order of General Tso Tofu and a veg lo mein. Shoveling in now. Asian Delight in Gloversville...exceptional food, great value and service. I hate to rain on the parade, but because you said this was a good opportunity to learn about Chinese restaurants in general, I have to point out General Tso's Chicken is not a Chinese dish. It is fine if you like it, but General Tso's is a made up dish for American tastes. Jennifer 8 Lee (really), a reporter for the New York Times, has a fun Ted Talk (easy to find) where she asks many Chinese natives what they think of General Tso's and they don't know what she is talking about. I've been to several places mentioned but it's hard to go anywhere else but Ala Shanghai if you want real Chinese food as Chinese people might eat it. It's so good that whenever I eat somewhere else I find myself thinking, I wish I was at Ala Shanghai. A Dragon on Madison is my choice, the office orders from them all the time. Anyways, the version at DP is pretty fantastic, I can also vouch for Sake Cafe. Ala Shanghai's is quite good, with a much lighter hand with the sauce so it's not as sickly sweet as many others. I'll add another vote for Rain on Lark St.
All others must bow down before Ocean Palace. Every other place mentioned is fly-by-night, over-priced for what you get, or Americanized with way too much sugar (and yes, I know General Tso is essentially an American dish). Ocean Palace might not be pretty but the food there is flawless. Ocean's Palace is the best. Ala Shanghai, Plum Blossom, and Buffalo Wagon are also good, but much more expensive. Rain is more expensive, but not good. SHINING RAINBOW ON CENTRAL AVE does an AMAZING job! Highly, highly recommend!!! Although I go to Tomo Bistro in Slingerlands primarily for the sushi, their General Tso's is REALLY good. Thanks everyone for the great recommendations! I'm used to having Ichiban, but the quality can vary drastically from day to day. Plum Blossom - I've had it in the past and it was delicious. However, it's a very unique taste unlike anything I've had before, so it can catch you off-guard if you're looking for "classic" General Tso. Ocean Palace - Just tried it and it was delicious. The owners seem very kind, and all of the food was extremely high quality. There were also some regulars that came in who sang its praises to me. Buffalo Wagon - Just tried this as well and also very good. High quality all around, but I give Ocean Palace the edge (slightly more flavor, much better rice). I look forward to working my way down the list and trying many of these other places. Thank you! Lee Lin's most popular dish has been its General Tso chicken, with a recipe my supertaster father has been using/refining for decades for American Chinese food lovers. It's made with dark meat, which tastes better than the white meat version, but you can try both versions, as well as other meats, tofu, and/or veg in GT sauce. You must specify whether you want it mild, medium, hot, or extra hot and you may ask for the chicken to be soft, extra crispy, more/less saucy, or with the sauce on the side. After a year of dedicated research, I'm happy to report that Ocean Palace and Buffalo Wagon are still atop my list as my two favorite spots to grab some great General Tso chicken. Ocean Palace gets bonus points for their supporting case of amazing fried rice and delicious incorporated vegetables. I can order from Ocean Palace and actually feel good about the fact that I'm eating American Chinese food before, during and after the meal. My wife is a more adventurous eater than I am when it comes to Chinese food and she loves sampling interesting new things she finds on the Ocean Palace menu.